On the first Saturday of March, join us for the Turtle Nesting Awareness Kick Off party in the 26° taproom. Enjoy some pints of Pompano’s finest brews while learning how you can help protect newborn sea turtles as they make their way to the ocean for the first time. This will be a fun event for every family member, including those of the four-legged variety. While the kids can play games and learn about sea turtles, parents can toast to Pompano Beach’s local aquatic treasures with the unofficial beer of sea turtles everywhere — Ziko’s Rage. A strong and complex imperial stout, Ziko’s Rage is named after the fierce and courageous Ziko the loggerhead sea turtle. When The Loggerhead Marinelife Center found Ziko, he had a steal hooked lodged in his mouth that required extensive medical treatment to remove. Though Ziko was mistrusting of humans and had a tendency to bight, he had an endearing character that connected with those that nursed him to health and eventually set him free back into the ocean. So come in and enjoy good beer for a good cause at the Turtle Nesting Awareness Kick Off 2017 party. Pompano Beach brewery and taproom, 26° Brewing, and regional restaurant chain, Flanigan’s Seafood Bar and Grill, have partnered to create a signature craft beer exclusively for Flanigan’s restaurants. Flanigan’s is a staple in South Florida, with roots dating back to 1959. Since then, the chain has expanded regionally to include locations from Miami to Stuart. Flanigan’s Pompano Beach location neighbors 26° Brewing, which has led to this pairing of one of South Florida’s most historic restaurants and one of Broward County’s newest craft breweries. To celebrate the release of “Joe’s Pale Ale,” there will be an invitation-only party on Tuesday, December 13th, at 26° Brewing in Pompano Beach. Starting December 14th, “Joe’s Pale Ale” will be sold exclusively at Flanigan’s locations for $1.79 per pint and $9.99 per pitcher. 26 Degree Brewing Co. has been growing by leaps and bounds over the past couple of months. It opened in September and soon began local distribution through Gold Coast Beverage. Now it’ll be adding culinary adventurers to that list. On Wednesday, March 23, the Pompano Beach brewery will host a five-course beer-paired dinner in its taproom. 26° Brewing is proud to announce that our Ziko’s Rage Imperial Stout received a Silver Medal in the Best Florida Beer Championship this past weekend. This was the first batch of beer we brewed here at the brewery! 26° Brewing is proud to announce that distribution is now underway. Use the map below to find your 26° Brewing favorites, located all across South Florida. Be sure to look for Captain Ron Hefeweizen and soon, IPA1A, Tri-County Common Lager, and Ziko’s Rage Imperial Stout. What? Your favorite watering hole doesn’t have the tasty Captain Ron? Let you bartender know they can get it through Gold Coast Distributing. Five years ago, 26° Brewing Co. cofounder Greg Lieberman began making beer as a hobby. 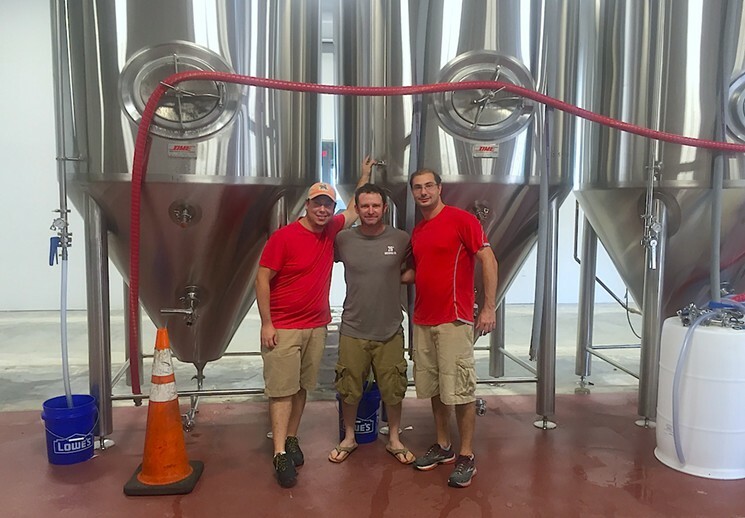 Today, the self-taught brewer is making more than 900 gallons per batch at his Pompano Beach brewery, set to open later this week. Like many people in the growing South Florida craft brewing industry, 36-year-old Lieberman decided to follow his dreams. Unlike most people, he left a solid job he loved to pursue his passion project. The former civil engineer says that he enjoyed his chosen line of work, but the desire to brew beer was stronger.